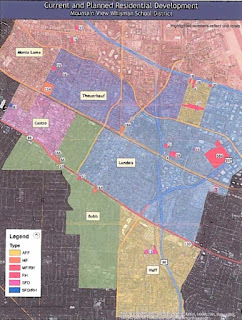 The current Mountain View Whisman School District boundaries in Mountain View send too many students to Bubb and Huff Elementary, and don't include the new school expected to open at Slater Elementary. Until you move to Mountain View, it never dawned on you how important it was to have a home near or within the boundaries of a great school. You, by almost pure luck, could be fortunate to have your children attend Huff Elementary School. It could be a daunting task of driving the kids to school every morning and picking them up from one end of town to the other, fighting traffic, bicyclists, beating red lights, learning the crosswalk count-down trick between street, etc. The drive could be a slight inconvenience, but it is better to go to the best school in Mountain View. Some residents think that he entire district map should be arranged by distance to home and if that factor requires another school to be built because there are too many kids for the school's capacity, then do so. It will make it easier for the kids to walk or ride their bikes and peace of mind for parents that their neighborhood school is nearby.